WARNING! This isn't your father's in-tank pump. Conventional wisdom used to be not to worry too much about getting "too big" of an EFI fuel pump. After all, the fuel that isn't used is returned to the fuel tank, right? Well, be sure that this fuel pump IS too big for most applications. Not only is this the first fuel pump of its kind to crank out an amazing 400 liters per hour (lph) of fuel, but it is enough to overwhelm the stock fuel lines on most vehicles. What this means is that the puny return line on most vehicles will alone create enough resistance to this massive flow of fuel that you will not be able to turn the pressure down to what your engine is looking for. If you don't replace the return fuel line you will be running pig-rich as 400 LPH of fuel takes the path of least resistance, into your engine. Ok, so I've got you a little concerned? Good. If you are not making over 600 horsepower (naturally aspirated) or well over 500 HP (turbocharged), then we have the perfect fuel pump for you--but not on this page. Either use our Walbro Fuel Pump Lookup App for a 255 LPH direct replacement to your OE fuel pump or else visit our Walbro 255 LPH Inline Fuel Pump page to get a fantastic pump for your performance vehicle. Still reading? Ok, great! Here are a few things to keep in mind. First, this is not an direct-fit, OE-replacement fuel pump kit like we sell elsewhere on the website. This kit is for individuals with the capability and desire to modify their existing in-tank setup to work with the new Walbro DCS 39/55 400 LPH high performance fuel pump you see pictured above. 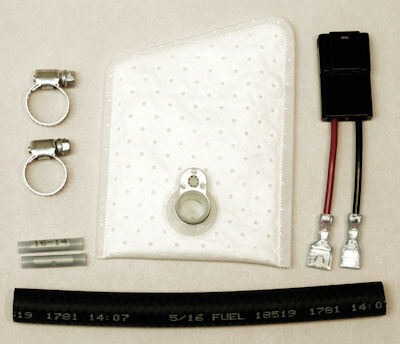 Included in the kit are some basic components that you will likely require, shown in the picture below. Second, you will have to replace your primary fuel line, return fuel line, and stock fuel pressure regulator. Hey, you didn't get to this level of performance doing things halfway, did you? Realize that you may even have to plumb a larger exit pipe from the fuel tank if the stock one can't handle 400 LPH of fuel. We at Fuel-Pumps.Net have been trying for years to warn consumers that there are junk fuel pumps out there that will destroy your engine. Most recently, there have been a wave of 340 LPH fuel pumps at incredibly cheap prices that have been the rage. Before you save yourself $50 and end up buying a new engine, ask these questions of the competition. What is the the "hot fuel" performance of your fuel pump? This is great. Most of them will have no idea what you're talking about. You see, normal operating conditions cause the gasoline to increase in temperature. Most flow charts are shown with the fuel at ambient (room) temperatures. As the temperature goes up, performance goes down. This is especially true in inexpensive fuel pumps. How well does your fuel pump handle ethanol? What's so nasty about ethanol? Well, you could read books like Significance Of Tests For Petroleum Products by Salvatore J. Rand, where he explains that it has to do with the broad range of pH's that ethanol introduces. Too low pH and it forms an insulating film between the brushes and commutator. Too high pH and it starts attacking plastic components. Problem is, there is no specification requiring ethanol to be a certain pH for sale for motor vehicles. Therefore, Walbro fuel pumps are designed with components that prevent pH from being a problem, making them truly 100% ethanol compatible. This means not using copper commutators, for example. But guess what you find when you open up these 340LPH pumps? Copper commutators, along with several other ethanol-unfriendly materials, including tin. Sure, I guess you could just say you'll never put ethanol in your 340LPH-equipped vehicle. But if they take shortcuts here, where else did they take shortcuts? How loud is your fuel pump? The Walbro DCS 39/55 fuel pump is not the quietest fuel pump in the world. Nobody really expects that out of such a high-performance fuel pump. But, the DCS 39/55 is the quietest in-tank fuel pump available at this level of performance. Remind yourself of that when your other fuel pump is giving you a migrane headache. Where is your fuel pump made? This is my favorite question. The cheap 340 LPH fuel pumps are made outside the USA. So, any way you look at it you're exporting jobs and dollars, probably to a country that is not even particularly friendly to our way of life. Walbro makes their automotive fuel pumps right here in the USA. What pump are you going to use?